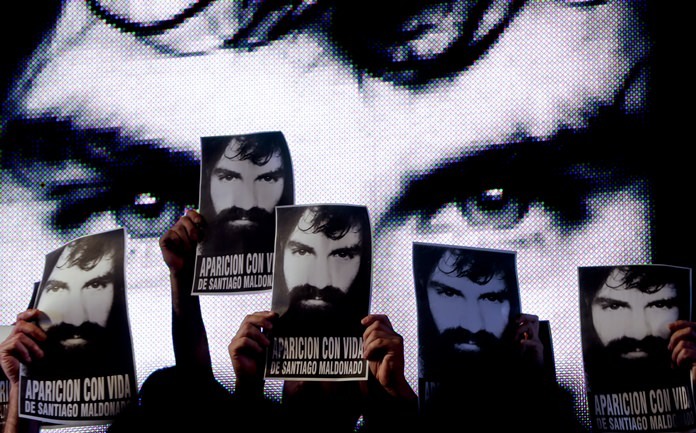 Buenos Aires, Argentina (AP) — The brother of an Argentine protester whose disappearance prompted nationwide demonstrations said Friday that the family believes a body found in a river is that of activist Santiago Maldonado. The family is now “convinced that the body is Santiago,” Maldonado’s brother, Sergio Maldonado, told reporters, before he walked into a morgue in Buenos Aires where the autopsy was going to be performed. The body was found Tuesday near the site of a protest on Aug. 1, when Maldonado was last seen alive. Protesters were demanding the release of a jailed Mapuche indigenous leader and the return of lands belonging to Italian clothing company Benetton that are claimed by the Mapuche as their ancestral territory. People at the protest said they saw police beat and detain Maldonado after he and others blocked a road in Chubut province, about 1,100 miles (1,800 kilometers) southwest of the Argentine capital. Police never confirmed the arrest and denied wrongdoing. But some rights groups accused President Mauricio Macri’s government of being part a cover-up. The case hit a raw nerve in Argentina, where thousands of forced disappearances and other human rights abuses committed during the bloody 1976-1983 military dictatorship still haunt many four decades after the end of state-sponsored violence. Last week, U2’s lead singer and social activist Bono asked Macri about Maldonado during a meeting in Buenos Aires and said he glad that Macri was taking the case seriously. Politicians from opposing political parties had demanded Macri’s government find the 28-year-old artisan and tattoo artist alive. Some analysts say the latest development in the case could turn problematic for Macri’s coalition ahead of Sunday’s midterm legislative elections. The body’s discovery had led political parties earlier this week to suspend campaigning ahead of the vote. Coast Guard divers discovered the body in a river in southern Argentina. Officials said there were reasons to believe it was Maldonado. They said Maldonado’s national identity card and a jacket that a witness said he was wearing when he went missing were found with the body. Members of Maldonado’s family blame border police for his disappearance and question how the body could have been found in an area of the river that they say had been scoured three times before.